Jewell Instruments: The 820 Shallow Water Series is the most recent addition to Jewell Instruments’ electrolytic tiltmeter line for geophysical and geotechnical applications. This is a waterproof tilt solution that provides civil engineers a cost-effective and practical alternative to tiltmeters rated for extreme depths. The 820 Shallow Water series is rated to 50 meters in depth and uses highly sensitive electrolytic technology to measure in one or two axes with a resolution to 0.0001° and virtually no long-term drift. Standard measuring ranges include ±0.5°, ±3° and ±50° with custom ranges available upon request. 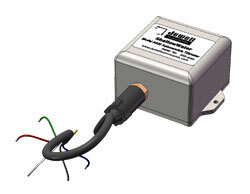 Analog, current and digital (RS232 and RS422) output options are also available. This tiltmeter is intended to monitor structural activity at relatively shallow depths such as bridges, dams, oil rig platforms or any other partially submerged structure.